Miguel Ángel Ríos, an Argentinean artist born in 1943, has received international acclaim for a suite of video-based works focused on images of spinning tops. The trompos, as they are called in Spanish, engage in a seemingly choreographed dance of power, combat, and annihilation. 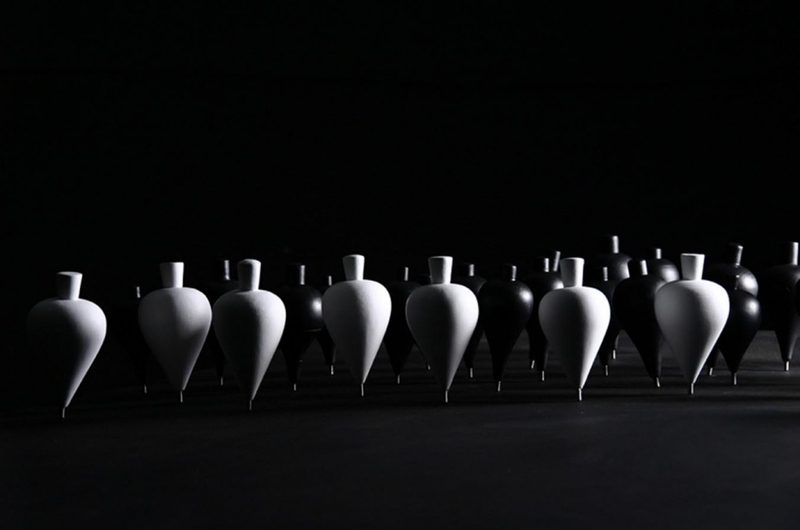 The video projection On the Edge is the follow-up to Ríos’s first video, the 2003 installation A morir (’til Death), which shows a group of black tops spinning. They gently roil around each other, bumping, colliding, and ultimately killing themselves off until only one top is left. The final top stands victorious, if only for a moment—it, too, succumbs to the forces of gravity. The allegory of life and death skillfully and creatively plays out in On the Edge. This 2005 video offers a sense of refinement and control, the allegory pushed up against the classic specter of black and white. Unlike A morir, which was filmed in a single take, On the Edge is more complex and controlled in its choreography. In some instances, the tops function as actors and seem to have prescribed roles and movements. The use of multiple cameras allows a seamless interplay of motion—a white top, for example, gliding gracefully in front of a row of black tops in single file. Ríos likes to think that a successful work always bears an element of risk, danger, or impossibility. On the Edge undeniably fulfills these criteria as it plays out the uncertainty and brevity of human life in a beautifully abstract and skillful way.